What we encountered was not a material world but a natural world that, from my thinking, deepens the voyage of life itself. After firing what would be my final shot at ducks and geese in 2018, I found the battery was dead in my old truck at the side of a desolate dirt road atop a Delta island. My choices were simple: To wait patiently for someone to come by or to hoof it – a two-mile walk atop a twisting levee. I chose the latter so off we went, youthful Labrador and hunter side by side. My less than three-year-old retriever, outfitted in a ragged camouflaged neoprene suit and me with floppy waders, shotgun, backpack and a heavy strap of ducks flung over my shoulder trudged along slowly. It was going to be an arduous trek, or so I thought, before the power of nature took over. Instead of a tiresome hike with a heavy load on a bitter cold day, the exercise became a melding with our surroundings. On our left, within the interior of the Delta island were the sights and sounds of white-fronted geese, tundra swans, sandhill cranes, pintail ducks and a plethora of highly animated shorebirds, mainly yellowlegs, black-necked stilts and white-faced ibis. Their utterances seemed to lift our halting steps, as if we were on a billowy cloud with a Beethoven symphony in the air. Think of Ode to Joy. On our right was the San Joaquin River, with wedges of water hyacinth floating along that carried stately white egrets who seemed to enjoy the free ride. There were flocks of mud hens paddling with the tide and close to the riprap bank were scattered bufflehead and golden eye ducks, pied-billed grebes and even a pack of river otters. The holistic experience enlarged my soul and gave me the feeling of sacred, though I’ve walked or jogged along this levee so many times over the years. Nature, always transformative and never repetitive, increases my capacity for emotion and respect, and connects me, in a strange way to the eternal. All it takes is getting away from routine and tromping around outdoors. My devoted Labrador, Addie, sniffed the north wind, trying to find a scent. Her ears weren’t dangling low but poised as if she felt the power of the moment. The dog literally pranced, its head bobbing as if to acknowledge every species as we paraded past. What we encountered was not a material world but a natural world that, from my thinking, deepens the voyage of life itself. The Central Valley is rich with wild critters and fantastic landscapes that many believe are only found elsewhere in the world. Yet, they’re right here, year around. So promise yourself to get outside to experience the greatest wildlife show on Earth, literally in our backyard. Your dog will love it, too. Ducks and sandhill cranes will stick around into March, and white-fronted geese will remain until mid-April. Experience a walk through old-growth valley oak and cotton wood trees at the Cosumnes River Preserve, beginning at the Visitor Center on Franklin Boulevard west of Galt, or check out the native plants and songbirds at Brannan Island State Park near Rio Vista, off Highway 160. If you insist, stay in your vehicle and drop by two outstanding destinations located west of Interstate 5. Late afternoons are best to tour Staton Island, set off the Thornton-Walnut Grove Road, and a stop at a bird mound at the Isenberg Preserve, off Woodbridge Road. 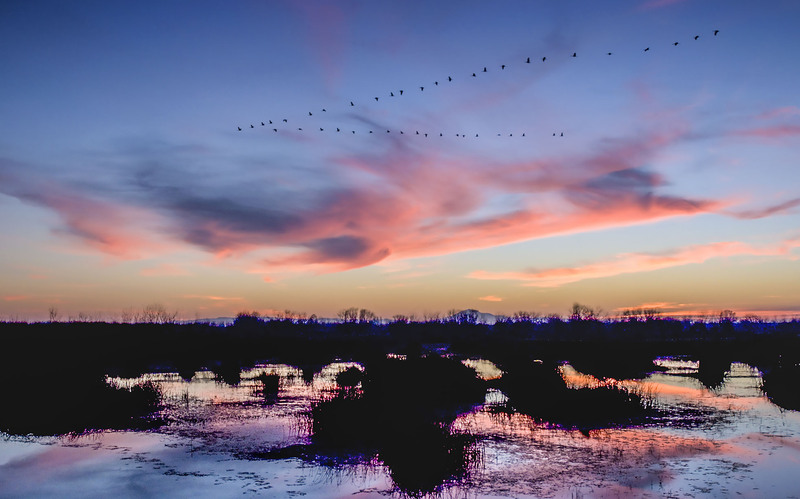 Take in the sights and sounds of thousands of migratory birds with Mount Diablo as a backdrop. Or, take a boat ride aboard a commercial Delta eco-tour and get the feel of the tidal water as nature unfolds before your eyes. These first-hand activities can be a life-changer, they are so compelling and so close to home. 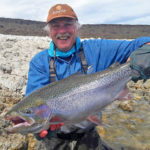 For nearly 50 years Peter Ottesen has written outdoors articles that have appeared in major newspapers around the U.S. and authored six books. He was named Writer of the Year in 1995 by the Outdoor Writer Association of California and in 2004 was elected to the California Outdoors Hall of Fame. A native of Hollister, he will be inducted into the California Waterfowler’s Hall of Fame in Feb. 2019. He is a landowner in the Delta, hunter and fly fisher, and an avid birdwatcher.